This page describes important, recently released changes in the behavior of Teams client when users are in any of the Skype for Business modes (SfBOnly, SfBWithTeamsCollab, SfBWithTeamsCollabAndMeetings). The purpose of co-existence modes is to provide a simple, predictable experience for end users as organizations transition from Skype for Business to Teams. For an organization moving to Teams, the TeamsOnly mode is the final destination for each user, though not all users need to be assigned TeamsOnly (or any other mode) at the same time. 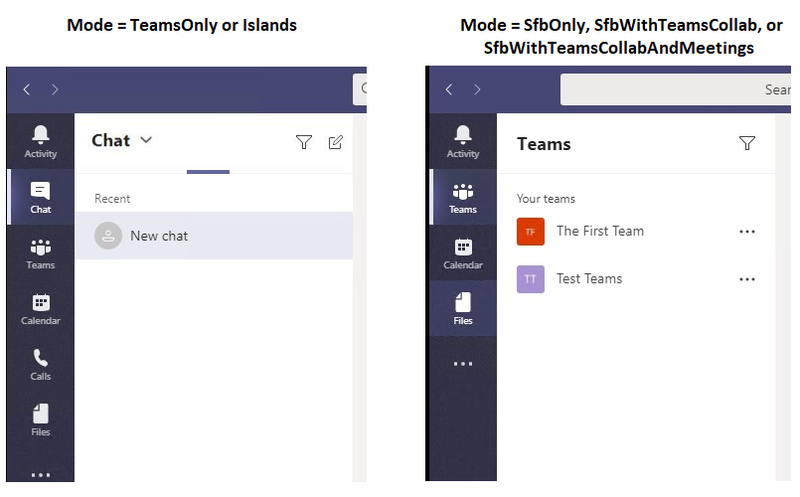 Prior to users reaching TeamsOnly mode, organizations can use any of the Skype for Business modes (SfBOnly, SfBWithTeamsCollab, SfBWithTeamsCollabAndMeetings) to ensure predictable communication between users who are TeamsOnly and those who aren’t yet. When a user is in any of the Skype for Business modes, all incoming chats and calls are routed to the user’s Skype for Business client. To avoid end user confusion and ensure proper routing, calling and chat functionality in the Teams client is disabled when a user is in any of the Skype for Business modes. Similarly, meeting scheduling in Teams is explicitly disabled when users are in the SfBOnly or SfBWithTeamsCollab modes, and explicitly enabled when a user is in the SfBWithTeamsCollabAndMeetings mode. Any Skype for Business mode Calling and Chat are disabled. Note: 1 For now, SfBwithTeamsCollab and SfBOnly behave the same, but the intent is for SfBOnly mode to also disable Channels and Files functionality in Teams; however, there is currently no setting that allows this functionality in Teams to be disabled. Administrators need not explicitly set these policy settings when using co-existence mode, but it's important to understand that these settings effectively behave as follows for a given mode. WARNING: The user 'user1@contoso.com' currently has enabled values for: AllowUserChat, AllowPrivateCalling, AllowPrivateMeetingScheduling, AllowChannelMeetingScheduling, however these values will be ignored. This is because you are granting this user TeamsUpgradePolicy with mode=SfBWithTeamsCollab, which causes the Teams client to behave as if they are disabled.